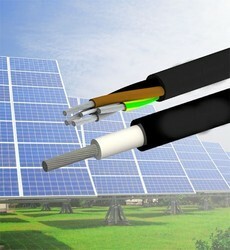 Our range of products include solar cables. Environmental concerns and the need for energy independence are catalyzing the growth of solar power. Not only can solar transform the way the world generates electricity, but these systems are extremely versatile with the ability to place solar photovoltaic (PV) panels in a variety of environments - from small-scale distributed generation systems on rooftops, to utility-scale solar energy plants in fields and deserts. As such, technological developments in the cable that make up solar power generation, transmission and distribution systems are aimed at improving efficiency, reducing cost and ensuring long-term reliability and performance. Simultaneously, the industry is striving to establish codes and standards for best practices and safe design of cabling systems. These trends are driving developments in cable technology, while also introducing key challenges for manufacturers. Everest Cables has upgraded its facility to take care of such challenges, and therefore has obtained the EN 50618 2014 standard approval i.e. "Electric Cables for Solar Photovoltaic Systems"
A. Solar Cables are used in DC System commonly referred as the array of Solar PV modules terminating in array junction box, and from array junction box to the inverter. The array here is referred to number of Solar PV modules that are interconnected. The AC cables are used from main panel to end use/grid supply. 1. Tinned Copper Flexible Conductor (Class-5, as per IEC-60228) with XLPO(Imported Compound)-Having UV and Ozone resistance, Excellent Weather-ability, in line with TUV 2pg standard now superseded with EN-50618 (Certificate Attached). 2. Tinned Copper Flexible Conductor (Class-5, as per IEC-60228) with XLPE Insulation & HOFR sheath- Having UV and Ozone resistance, Excellent Weather-ability, in line with IS-7098 (Part-I). 3. Tinned Copper Flexible Conductor (Class-5, as per IEC-60228) with PVC/HOFR Insulation & HOFR sheath having UV and Ozone resistance, Excellent Weather-ability in line with IS-6942010. We also manufacture cables that are used from array junction boxes to inverter and the main panel conforming to EN-506182014/IS6942010/IS7098(Part-1), all are weather proof cables meeting long service and thermal ageing characteristics as required for the DC cables. B. Similarly we also manufacture Armoured/Un-armoured with tinned/bare copper and Aluminium conductor cables interconnecting DB/Main panel to transmission system which are referred as Solar AC cables complying to IS-6942010 or IS-7098(Part 1) with excellent weather-ability meeting long service and thermal ageing characteristics. Looking for Solar Cables ?